Spray a shallow baking dish with non-stick cooking spray. Halve squashes. Brush cut sides sparingly with olive oil. 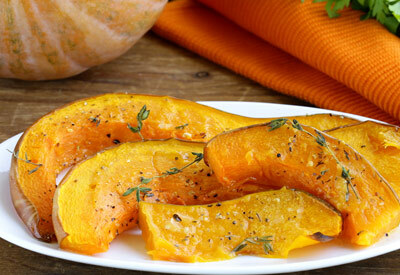 Arrange squash halves cut side down in baking dish. Cover with foil. Bake for about 1 hour or until squash is soft when pierced; set aside. Melt butter in a small saucepan. Stir in herbs and cheese until well blended. Scoop out seeds and strings from squash. Turn cut side up on a serving platter. Drizzle butter mixture liberally over squash.